In the aftermath of the gruesome English Staplehurst rail crash of 1865, only one first-class passenger car remained on the rails. One of its passengers was Charles Dickens, arguably one of the greatest figures of English literature. With him were two women, a young lady named Ellen "Nell" Ternan, and Ellen's mother. Many scholars have dismissed Ellen as the married-Dickens’ platonic companion. Other evidence points to the contrary, identifying Ellen as the married author's true love. Either way, Ellen is receiving a lot of press this month, as February has been set aside to celebrate the 200th anniversary of Charles Dickens’ birth (February 7, 1812) in over 50 countries. Dickens was a literary rock star while he was alive, and his popularity hasn’t dimmed. First published at age 23, his works retain their bite and richness despite the passing of time. Mystery, love, longing, sacrifice, inequity, corruption, and other timeless themes are woven into tales with memorable characters and well-crafted plots. His legacy continues, perhaps in ways he wouldn’t have expected. It’s not uncommon to yearn for a Dickensian Christmas. Alas, “Dickensian” also is used to describe poverty and squalor. But he was also quite human. Dickens was a complicated person, the survivor of a brutal youth, an energetic man, a demanding father, and a not-so-doting husband. He parted from his wife Catherine in 1858, after ten children and twenty-two years of marriage, shortly after meeting Ellen Ternan. He was forty-five; Ellen was eighteen, performing in The Frozen Deep, which he produced. Ellen is said to have been clever and passionate, interested in politics and literature. She left the stage shortly thereafter, and was supported by Dickens for the rest of his life, residing in houses he took under false names. She received £1,000 upon his death, as well as income from a trust fund ensuring she’d be well cared for throughout her life. Most of the world didn’t know about Dickens’ thirteen-year long relationship with Ellen. He kept her well-hidden from the media and the two destroyed whatever correspondence they may have shared. She didn’t accompany him on his two trips to America, although she did travel with him on occasion (they were returning from France when they were in the train accident). Other evidence of their liaison survives, however, including confirmation from Dickens’ children, who spoke unhappily of his relationship with Ellen and the sad news that Ellen bore a son who died in infancy. What happened to Ellen? Six years after Dickens died, she married a pastor twelve years her junior (it’s said she told him she was 23, not 37. Sounds a little bit like actresses of today!). They had two children and ran a boys’ school. Ellen hasn’t been forgotten, of course. The Invisible Woman: The Story of Nelly Ternan and Charles Dickens, by Claire Tomalin, was published in 1991, inspiring an upcoming movie starring Ralph Finnes and Felicity Jones. Invisible no longer, Ellen’s name is forever linked to Dickens’—a complicated, flawed, gifted man by the standards of his time, as well as our own. Have you ever read any Charles Dickens outside of a school assignment? Which of his books is your favorite? 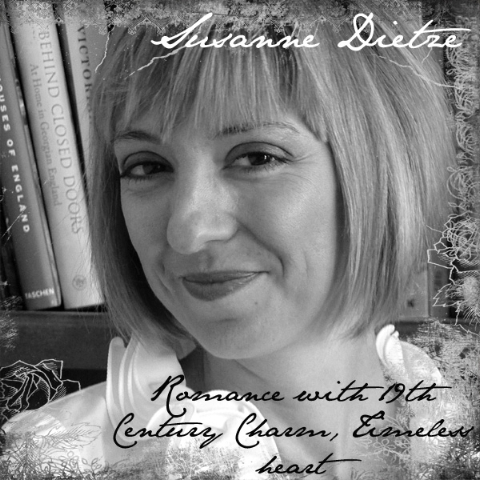 Susanne Dietze has written love stories since she was in high school, casting her friends in the starring roles. Today, she writes in the hope that her historical romances will encourage and entertain others to the glory of God. Married to a pastor and the mom of two, Susanne loves fancy-schmancy tea parties, travel, and spending time with family and friends. She won first place in the Historical category of the 2011-2012 Phoenix Rattler, and her work has finaled in the Genesis, Gotcha!, and Touched By Love Contests. You can visit her on her personal blog, Tea and a Good Book, http://www.susannedietze.blogspot.com/. Interesting story, Susie. I never knew this about Dickens. But truthfully, I never knew very much about him, and always (for some strange reason) associated him as the Scrooge character. I've read two Dickens' stories, and tried two read two more but couldn't get into them. The two I've read, not surprisingly, are: A Christmas Carol, and The Prince and the Pauper. I am really excited about this movie (I'm not sure I want to think that good ol' Charlie was as handsome as Ralph Fiennes but possibly he is quite suited to play such an intense, complicated genius). I haven't read all of his works by any means but I've listened to quite a few of his books on audio and probably have seen every one that has been made into a movie or series. I knew about his 'lover' but again I'm surprised about the age difference. I wonder if she'd been closer to his age if he would have kept it as hush-hush. Of course that didn't matter as much in the 19th C.
Wonderful post, Susie! I'm fascinated by Dickens' life and writing. I'd suggest watching BLEAK HOUSE for anyone who hasn't seen the mini series. Gillian Anderson starred in it and will be in the upcoming Masterpiece presentation of GREAT EXPECTATIONS. PBS might have done a Season of Dickens much as they did The Complete Jane Austen, if it wasn't for our need to have Season Two of Downton Abbey. Oh, I think Nicholas Nickleby is on this season as well. I also love Our Mutual Friend, set with a background of the Dust Bin industry (garbage collecting in London). Such rich characters and names. I don't suppose we can get away with them nowadays! You mentioned associating Dickens with Scrooge--one thing that always gets me is Scrooge's legacy (within the story at least) is that he became known for "(keeping) Christmas well." Perhaps a "Scrooge" should be a generous, merry guy! Ah well, no use fighting that one. My other favorite is Tale of Two Cities. I first read it as a freshman in high school and I preferred it to Great Expectations. Speaking of which, there's a new movie on it in the works with Helena Bonham Carter as Miss Havisham. I'll totally see it, of course! Deb, I saw the teaser for The Old Curiosity Shop after Downton Abbey, and I'm eager to see it. I know very little about it. You mentioned Little Dorrit the other day...I need to watch that, too. Wow, I'd never heard of Nell until today. But then again, Charles Dickens never interested me enough to wikipedia him. Yes, I enjoyed A Tale of Two Cites and Christmas Carol, but beyond that, I never really felt compelled to read any of his other works. Now that I know this about him, I'm interested in watching Voldemort play him in the movie. Thanks for the history, Susie. While it was only a short story and not a book, I've always had a soft spot for A Christmas Carol - I really enjoyed listening to Patrick Stewart read it, too! Gina, I'm curious about the movie too. I tend to look at Ralph Finnes as Voldemort now--I always think of him and the CGI required to remove his nose, etc! Sigh. But anyhoo, I think Finnes is maybe producing this movie as well as starring in it. I had to read Bleak House in college and (sorry Deb) it wasn't my favorite. It's sad and long. Maybe I'd like the miniseries better. Hi Karl! Patrick Stewart's version is fabulous. That'd be a great CD to listen to in the car at Christmastime. I wish I could've seen the one-man performance. Ah, we have the Patrick Stewart reading of A Christmas Carol too. I've tried various abridged versions, but they always leave out something I find important. My oldest played Tiny Tim in a community theater production of Scrooge. Fun times. But I haven't read many of Dickens' other works. I've read a few for class, and I think I've started a few outside of classes that I've never finished. Perhaps it's the length that scares people away? A Christmas Carol is much shorter than his novels. Have I read Dickens apart from a school setting? A little. Probably portions of the first chapter of most of them. Yes, he had trouble hooking me. In school--A Christmas Carol and Great Expectations. I think the length of most Dickens books is intimidating, CJ. Reading them is an investment, and some of the elements might be problematic for contemporary or younger readers. My oldest kid tried to read Oliver Twist and had to keep a dictionary close by. How fun that your son played Tiny Tim! A Christmas Carol is nice and short. Maybe this year. Barb, those two novels you mentioned seem to be pretty standard as reading requirements in a lot of schools. One thing about Dickens, he could write some interesting hooks through the course of each book. So many of them were published as serials, so he had to be good at keeping things interesting throughout. I think Chuck had a role in Elizabeth Gaskell's career. She did a serialized story or two with him. I think. Elizabeth Gaskell wrote Mary Barton, Cranford, Wives and Daughters, and North and South. Sounds like we're on the same wavelength, DeAnna! I think I could've used an excel spreadsheet when I read Bleak House, Deb. And a lot of sunshine, because it really was, er, bleak. But you're wooing me toward the miniseries! Fascinating. I read Great Expectations on my own as an adult and enjoyed it. There have been several movie versions of Great Expectations, too, Dina. I don't remember much of the one with Gwyneth Paltrow and Ethan Hawke except that his name was Finn, not Pip, and everything seemed green. The new version should be interesting, too!